The Indie game industry has evolved a lot over the past couple of years. We’ve some great indie titles coming out lately, and there’s a new one in town that’s hoping to take away all the attention from the smash-hit PUBG. 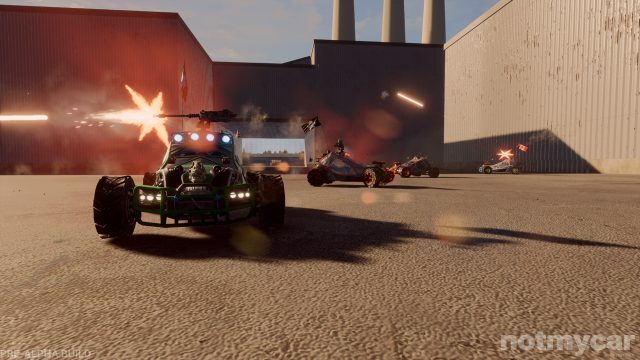 Meet Notmycar, a game that blends battle royale game genre and demolition derby, sort of. Developed by NMC Studios, Notmycar is the latest take on the battle royal genre of games that are coming out lately. Although very little is known about the game, it certainly sounds like a lot of fun. You can either head over to the game’s official website to see some photos of the game or head over to Dan “Greenskull” Hamill’s Mixer account to see the first gameplay of this upcoming title. It follows PUBG-style gameplay where you’re dropped into a map from an airplane. You get to choose the spot to land and collect car upgrades from there. As you’ll progress through the game, you’ll stumble upon a lot of different items/ upgrades for your car which includes artillery, bumpers, etc. Just like PUBG, you have to be the last one standing or in this case, the last car rolling. No further information about the game is released just yet. In fact, we don’t even have a trailer for it. If you’re interested in trying it, you can head over to game’s website and sign-up for the pre-alpha. That being said, let us know your thoughts on this. Would you be interested in giving it a shot? Let us know your opinion by shooting a comment down below.